Following a preliminary review of data into the suspected International Space Station (ISS) ammonia leak, NASA ground control teams are now confident that an initial false indication, compounded by the effects of the response to that indication, was to blame for the suspected leak of ammonia into the interior of the station. The ISS, like all spacecraft, requires a heat rejection system to radiate the heat generated by its electrical systems into space. However, since the station’s vast array of electrical equipment is widely dispersed both inside and outside the station, a system to transport the generated heat to the station’s radiators is also required. Such transportation of heat is best achieved via transferring the heat to a liquid, which can then be easily piped away from the electrical equipment to the station’s radiators. Ammonia is typically used as a coolant in spaceflight systems, due to its low freezing point, which makes it both a very efficient coolant, and also prevents the extreme cold of space from causing coolant to freeze in the lines, thus causing line blockages. However, an issue with ammonia, specifically with regard human spaceflight systems, is that it is a toxic substance, and thus presents safety issues when it is used in an environment where human beings live and work. As such, it was a deliberate design philosophy of the ISS to keep ammonia outside the station only, away from the internal environment where the crew operate. 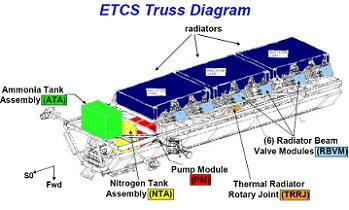 This external ammonia cooling system is known as the External Thermal Control System (ETCS). However, this itself generates its own issues, since heat generated internally still needs to be transported to the station’s external radiators. Because ammonia cannot be used as an internal coolant, water is used to transport heat away from the internal electrical equipment. This internal water cooling system is called the Internal Thermal Control System (ITCS). There are two separate ITCS water cooling loops that operate inside the station – one called the Low Temperature Loop (LTL), which operates at around 4 degrees centigrade, and the other called the Moderate Temperature Loop (MTL), which operates at around 17 degrees centigrade. Since the water cannot be directly piped outside the station, as it would freeze in the coldness of space, the heat from the internal water loops must instead be transferred the external ammonia loop, via a piece of hardware called an Interface Heat Exchanger (IFHX). Both the internal and external cooling loops are connected to the IFHX, with the heat from the internal water loop being transferred to the external ammonia loop as it passes through the IFHX. Cool water then flows out of the IFHX back inside the ISS, while warm ammonia flows from the IFHX to the external radiators. 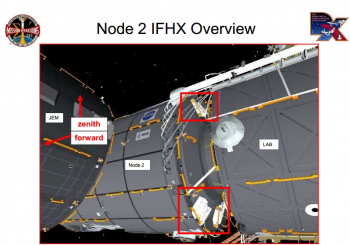 As detailed in an IFHX Failure Response Analysis Team (FRAT) briefing available to download on L2, there are 10 IFHXs on the ISS in total – 2 on the US Destiny Lab, 2 on Node 3, and 6 on Node 2. They are located on the exterior of the ISS (i.e. outside of the pressure vessel), beneath the MMOD shielding on the endcones of their respective modules. While there is no direct connection between the internal water loop and external ammonia loop via the IFHX, a failure scenario does exist whereby a breach of an IFHX could cause ammonia from the external loop to enter the internal water loop, from where it could enter the ISS atmosphere. 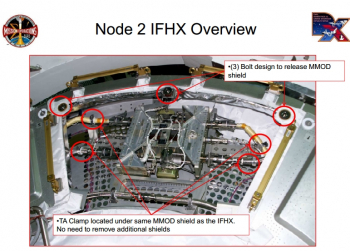 If an IFHX breach were to occur, there are a number of indications that would alert ground control teams to the incident. For a rapid ammonia leak into the internal water loop, the water loop accumulator quantity would be expected to quickly reach 100 per cent, prior to a rupture causing a water/ammonia mixture to leak into the cabin causing a sudden increase in atmospheric pressure. If the ammonia leak were only a slow leak, then the water loop accumulator quantity would be expected to slowly rise, with ammonia eventually diffusing into the cabin through permeable materials, although it is not expected that ammonia would be present in the cabin atmosphere in measurable quantities for up to one day. A set of extensive Anomaly Resolution Team (ART) notes obtained by L2 provides full details on the chain of events surrounding the suspected ammonia leak, a full overview of which was already detailed in a previous article on-site. According to the L2 notes, the chain of events began to unfold at around 9:45 AM GMT on 14 Jan, when the “Node 2 LTL accumulator quantity jumped up 15 percent” (to a total quantity of 55 percent), and “the loop pressure increased about 5 kPa (0.7 psi)”. This automatically triggered a toxic atmosphere warning. Additionally, the notes go on to detail that “two seconds after the toxic atmosphere warning annunciated, three Node 2-2 MDM cards (9, 13, and 15) failed their IO BIT (Input/Output Built In Test)”. 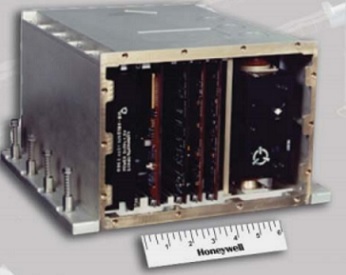 MDMs are essentially command and control computers, and the failure of the cards in question took with them insight into the Node 2 LTL accumulator quantity. Ground teams immediately identified the situation as a possible ammonia leak, and identified the IFHX that was suspected of causing the leak as the one which interfaces the loop B ETCS with the Node 2 ITCS LTL. In response, the flight crew executed their emergency procedures of donning Portable Breathing Apparatus (PBA), shutting off Inter Module Ventilation (IMV), and isolating themselves in the Russian Segment (RS) by closing the Node 1 Aft CBM hatch. Ammonia measurements subsequently taken in the RS were negative. Meanwhile, ground teams shut down the Node 2 LTL, the suspect IFHX was bypassed, while the loop B ETCS Pump Module (PM) was shut down, and the loop B pressure was reduced by venting nitrogen (which is used to pressurise the ammonia cooling loops) into space. Due to the loss of the entire loop B ETCS and the Node 2 ITCS LTL, equipment powerdowns were necessitated in order to reduce heat loads on the system. After a short time, the crew were briefly allowed back into the US Segment when no cabin pressure increase was detected, however shortly after, a rise in USOS atmospheric pressure was detected, leading to the crew being re-isolated in the RS. However, atmospheric measurements taken by the crew during their brief time in the USOS did not detect the presence of ammonia. The L2 ART notes go on to detail how the ground teams gained enough confidence to eventually let the crew re-enter the USOS, following a careful review of all available data and evidence from the event. While the on-orbit crew spent the day isolated in the RS, the teams on the ground were busy trying to interpret the data available, which, upon closer examination, did not conform to the expected signature of an ammonia leak. In order to gain more data on the event, ground teams re-activated the Node 2 ITCS LTL, in order to gain insight into the LTL pressures. However, with its IFHX bypassed, the heat in the LTL was not able to be transferred to the ETCS ammonia loop, and thus the operating temperature of the Node 2 LTL was higher than normal, and continued to rise. Additionally, as detailed in the L2 notes “The Node 2-2 MDM was power cycled and the power cycle recovered LTL ITCS data. LTL ITCS accumulator quantity was at nominal level, indicating no ammonia leakage into the ITCS loop”. While the LTL ITCS showed no signs of an ammonia leak, the brief rise in cabin pressure was explained by the fact that all ventilation was shut down (since it is a fact that reduced air flow leads to increased air pressure), and other measures such as equipment powerdowns and the crew donning breathing apparatus could also have contributed. It was not possible to measure ammonia levels in the USOS cabin atmosphere, since the only piece of hardware capable of doing this – the Air Quality Monitor (AQM) in the Japanese Experiment Module (JEM) – was not plugged in to its Utility Outlet Panel (UOP) power socket, and the crew were unable to plug it in since they were locked out in the RS. Eventually, after several hours of analysis, “the ART came to a consensus that the data is not consistent with a large ammonia leak across an IFHX”, stated the ART notes. Ultimately, ground teams came to the conclusion that the initial Node 2 LTL accumulator quantity increase was likely an erroneous reading, caused by the Node 2-2 MDM (which later went down following an error), and that the atmospheric pressure increase, which teams initially thought was a confirmation of an ammonia leak, was in fact a result of the response to the first false indication. The crew were eventually cleared to re-enter the USOS, wearing PBAs, whereupon they took measurement of ammonia levels in the cabin atmosphere, which were all nominal. Ground teams have spent the past day undertaking the process of re-pressurising the loop B ETCS, re-starting the loop B PM, and re-integrating the bypassed IFHX into the cooling system, in order to allow all equipment to be re-powered. The process was expected to take a while, since ammonia in the loop B system was in liquid state in colder areas, and gaseous state in warmer areas, meaning a careful process needs to be followed to prevent cold, liquid ammonia from following into an IFHX and freezing it. No further indications of an ammonia leak have occurred since, and the crew were back at work the following day on their usual program of scientific activities, with the powerdowns of the previous day having had little impact on experiments and data gathering. If nothing else, the incident served to exercise the well-practiced procedures, proving that both the crew and ground teams responded in a timely and appropriate manner to a situation that could have been very dangerous if missed – thus serving to prove the effectiveness of NASA’s vigorous regime of procedural training and simulation. (L2 Members refer to the L2 ISS Section for Updates, Images and Presentations relating to this situation on the ISS).